WASHINGTON (Reuters) - Burning passions over Donald Trump’s presidency are taking a personal toll on both sides of the political divide. For Gayle McCormick, it is particularly wrenching: she has separated from her husband of 22 years. “It totally undid me that he could vote for Trump,” said McCormick, 73, who had not thought of leaving the conservative Republican before but felt “betrayed” by his support for Trump. Three months after the most divisive election in modern U.S. politics fractured families and upended relationships, a number of Americans say the emotional wounds are as raw as ever and show few signs of healing. The rancor has not dissipated as it has in the aftermath of other recent contentious U.S. elections. A Reuters/Ipsos opinion poll shows it has worsened, suggesting a widening of the gulf between Republicans and Democrats and a hardening of ideological positions that sociologists and political scientists say increases distrust in government and will make political compromise more difficult. Sixteen percent said they have stopped talking to a family member or friend because of the election - up marginally from 15 percent. That edged higher, to 22 percent, among those who voted for Democrat Hillary Clinton. Overall, 13 percent of respondents said they had ended a relationship with a family member or close friend over the election, compared to 12 percent in October. “It’s been pretty rough for me,” said Rob Brunello, 25, of Mayfield Heights, Ohio, a truck driver who faced a backlash from friends and family for backing Trump. “People couldn’t believe Trump could beat Hillary. They are having a hard time adjusting to it,” he said. At the same time, many people reported their relationships have not suffered because of the election. The poll found about 40 percent had not argued with a family member or friend over the race. 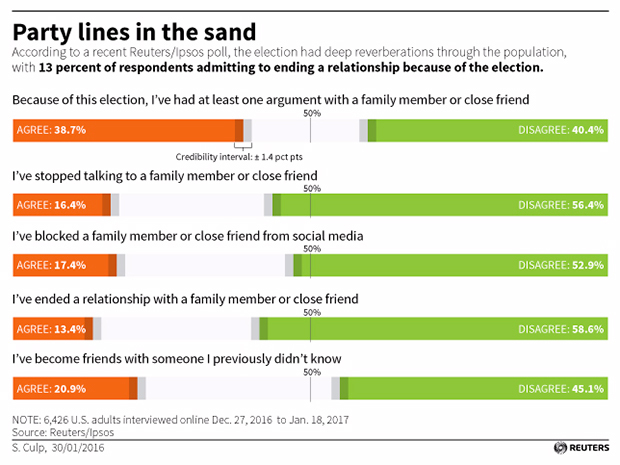 The election also enabled a significant number to forge new bonds - 21 percent said they became friends with someone they did not know because of the election, though the poll question did not ask respondents to specify if the friendship was with someone from a different party. The election’s fervor has spilled into the streets since Trump’s inauguration on Jan. 20. Hundreds of thousands of people marched in protest on the day after Trump took office, and there have been demonstrations against a travel ban on visitors from seven Muslim-majority countries. Arguing over Trump has become a bitter reality for many Americans. He said his friend is gay and worries about Trump’s sometimes demeaning campaign rhetoric about minority groups including Muslims, Hispanics, immigrants and the disabled. “I think people are getting too wound up,” Lomey said. Sue Koren, 57, a Clinton supporter in Dayton, Ohio, said she can barely speak to her two Trump-backing sons and has unfriended “maybe about 50” people on Facebook who support the president. George Ingmire, 48, a radio documentary producer in New Orleans, said he broke off a close relationship with an uncle who had helped him through his father’s suicide because of his uncle’s fervent support for Trump. Many personal conflicts erupt on social media. In the Reuters/Ipsos poll, 17 percent said they had blocked a family member or close friend on social media because of the election, up 3 percentage points from October. LeShanda Loatman, 35, a black Republican real estate agent from Delaware, has severed ties on social media with former co-workers and old friends over their support for Trump and their criticism of the Black Lives Matter movement against violence and racism against blacks. “I haven’t come across anybody who was openly belligerent about the election or Black Lives Matter movement when I was out in public. It’s just on Facebook,” said Loatman, who voted for Green Party candidate Jill Stein. Eventually, McCormick’s husband changed his mind about Trump and wrote in former House of Representatives Speaker Newt Gingrich in November, but by that time she had decided to strike out on her own. While the couple plans to vacation together and will not get divorced - “we’re too old for that” - she recently settled in her own place in Bellingham, Washington. “It really came down to the fact I needed to not be in a position where I had to argue my point of view 24/7. I didn’t want to spend the rest of my life doing that,” said McCormick, who ultimately cast a write-in vote for Democratic U.S. Senator Bernie Sanders of Vermont. In St. Charles, Missouri, retired tour company operator Dennis Conner, who is a Trump supporter, says he has avoided confrontations with his brother, sister-in-law and brother-in-law, who were Clinton backers. —The Reuters/Ipsos poll was conducted online in English in all 50 states. It has a credibility interval, which is similar to margin of error, of 1 percentage point.